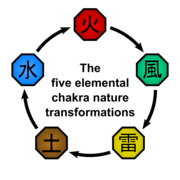 There are five basic types into which the nature of chakra can be transformed, called the Five Elements Nature Transformations (五大性質変化, Godai Seishitsu Henka). These five types are also called elements and are not only the origin of the names of the Five Great Shinobi Countries, but also the foundation of all elemental ninjutsu. The five basic natures are all connected to each other in a circle, each being weaker than one and stronger than another. • Fire (火, Ho) natured chakra allows for Fire Release (火遁, Katon), which is strong against Wind but weak against Water. • Wind (風, Kaze) natured chakra allows for Wind Release (風遁, Fūton), which is strong against Lightning but weak against Fire. • Lightning (雷, Kaminari) natured chakra allows for Lightning Release (雷遁, Raiton), which is strong against Earth but weak against Wind. • Earth (土, Tsuchi) natured chakra allows for Earth Release (土遁, Doton), which is strong against Water but weak against Lightning. • Water (水, Mizu) natured chakra allows for Water Release (水遁, Suiton), which is strong against Fire but weak against Earth. Basically, this means that if an elemental jutsu is put against an elemental jutsu of the same level, but of a stronger nature, then the jutsu with the superior nature will prevail. 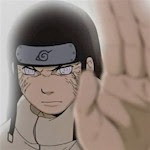 However, a jutsu with a weaker nature can overpower a jutsu with a stronger nature if the former is of a higher level. In general, every person has chakra that has an affinity towards one of these types, a characteristic that seems to be genetic, since whole clans sometimes share the same affinity. Most members of the Uchiha clan, for example, had an affinity towards the Fire nature. To find out what affinity someone has, pieces of paper made from a special type of tree (that are grown and fed with chakra) are used that react to even the slightest hint of chakra in any of a number of ways, depending on the nature latent in the chakra. * Fire: the Paper will ignite and turn to ash. * Wind: the Paper will split in two. * Lightning: the Paper will crumple up. * Earth: the Paper will turn to dirt. * Water: the Paper will become damp. This affinity makes it easier to learn how to create and control the nature in question, although even with an affinity this process will usually take any number of years. 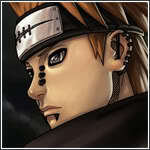 Shinobi are not limited to the nature they have an affinity to, though. By the time they reach the rank of Jonin, most shinobi have mastered two natures. However, because of the difficulty of mastering a nature and the time required to learn it, it is almost impossible to master all five natures in normal way. However, people who are born with the Rinnegan possess all the elements, while Kakuzu got them stealing the hearts, and chakra, of others. - Katon, or Fire Element, takes the form of fire and flame attacks. These can be fire balls or extended flame throwing. Fire is typically a specialised offensive element. - Doton, or Earth Element, takes the form of earth and mud based attacks. These can be walls made from mud or the ninja maneuvering himself below ground to attack his opponent from below. Earth can change the hardness composition of objects, making something hard as steel or soft as clay. - Fuuton, or Wind Element, takes the form of wind based attacks. These can be huge gusts or sustained wind storms. Wind is typically a specialised offensive element, good for close to mid-range attacks. - Suiton, or Water Element, takes the form of water based attacks. These can be walls of water used as shields or water formed into large striking jets. In this regard, Water is very diverse when it comes to shape modification. - Raiton, or Lightning Element takes the form of electrical and lightning based attacks. When used in conjunction with metal based weapons, the power becomes amplified. Lightning is good for middle to long-range attacks.